I have been working on two dolls at the same time. 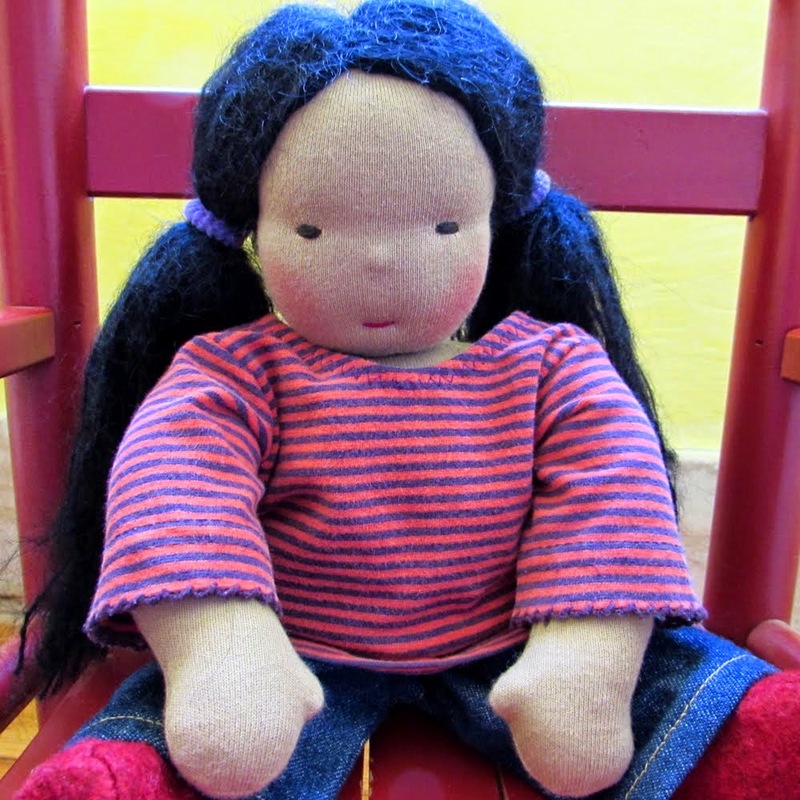 One custom order was a sort of emergency call by a person who had bought a doll long time ago. The dolls I created are very similar in looks. Both have brown eyes and brown hair. Only one of them has long hair - the other short hair. So I called them Big and Little Sis'! For sure, they must be related! As they came to life in my little studio, they became rather good friends - chatting, hanging out together, pondering their new lives in different places. 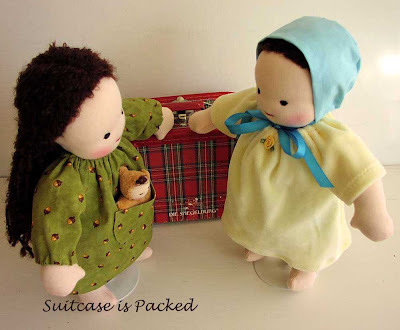 Today their suitcases are packed, and they will leave town and go on a long trip. Little Sis' appeared very worried. What will life on the East Coast be like? I told her that a little boy named Alfredo will be so happy to meet her. He lost another doll I made for his family. Hopefully little Sis' will be able to fill the big hole that was left when his first baby was lost in the streets of Philadelphia. I wonder who took in this baby? Why wasn't it returned by the finder. Hopefully she is safe! Big Sister is moving to a foreign country. She is quite excited about her new adventures living near London, Great Britain. I told her how pretty and green it is there in the summers. I know, because I lived there for a year when I was a teenager. But that's another story I must tell you later. Maybe Big Sister will even get to see the Queen of England! I hear she just joined Facebook, my friends! Long Live the Queen! Ulla, your dolls are beautiful. I love the long hair, it looks so pretty. They look ready to be loved! Awwwwhhh, they are going to miss each other dearly! Tears come to my eyes. I hope both dolls have wonderful lives in their forever homes and the lost doll has been happily adopted and we will never see her picture on a milk carton. I also play with my toys and speak to them when making, especially my mice. Your dolls are lovely! I wish my daughter was still little and played with dolls. I love the little mini ones you have in the top photo of your blog...too cute! Hopping over from the etsy forums. They are so adorable, you are really talented! These little dolls are going to bring so much love into their new families. And, how lucky to travel to such a beautiful place. Oh my that is the cutest thing EVER ! So, so sweet! Your dolls are adorable!! !